This is my favorite load for the AR. I shoot this load out of a 10" SBR (Registered of course) as well as a 16" Gun and a 18" HB. I get sub 1" MOA @ 100yrs out of all three of them. I load it as follows COL is set up to handle standard military mags, you could lengthen it out for a bolt or break over. Powder: Vihta Vuori (Lapua) N135 22Gr. As I said I have a number of AR's and I run this load out of all of them. Remember this bullet is for 1:7 to 1:10 twist guns ONLY!! Pizzaguy, what velocities do you get out of the 16"? I'm sorry I haven't ran it through the crony yet, maybe next weekend I'll get a chance to spend the day at the range. I just finnished a couple new loads for the .308 & the .338 Lapua to test next weekend, I'll be setting up the crony for them so I'll be sure to run the .223 and get the data. Welcome Pizzaguy, Enjoy the company. Pizzaguy, you cover the waterfront - .223, .308, .338. Definitely keep us posted on your activities and load results. I hope to have a .338 one day but I'm starting at the bottom and working up. I've been shooting my .270 Win at longer and longer ranges. Building a 24" AR in .5.56 right now to learn more about windage. Maybe a .338 in the next year or two for my real long range gun. Include some pictures also! Well I had just uploaded a pic of my SBR, but I can't find where it went so it's on here some where. lol I'm impressed with the Lapua, but I don't like it any better than the .300 WSM right now. I've only had it out to 1000yrds so when I get a chance to shoot longer we will see if I feel any different then. you can upload .jpgs directly into your post. Use the "post reply" button then note you can brouse and upload attachments. They don't show up in the preview mode but they will be in your post. I would suggest reducing their size to 1000 pixels or less across. If you upload them to the photo gallery you can't easy load or link them to a post. 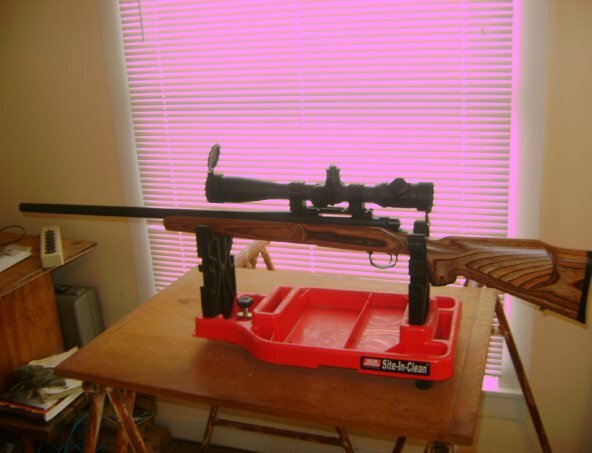 This is a Remington 700BDL HB with a Knous Pro 6.5 to 25. Mildots...always mildots. Those are all beauties! The first thing I did when I saw your SBR with silencer was look at your location. I hope my new AR build shoots as good as your AR custom match. 1 and 3 are interesting but the 2nd sure looks fine to me. I got that gun at a pawn shop (with a different scope) for $600. I floated the bbl and I'm getting ready to pillar bed it. I'm planning to take some pics and do a how to on pillar bedding. I hope my new AR build shoots as good as your AR custom match. Head space is VERY important as well as a good trigger. I'm belssed with a class III manufacture as a good friend, so he fits any of my parts that need machined. Free float the bbl and a good trigger (I'm stuck on jewel triggers right now) the Timminy's are nice, but I like the adjustments in the jewel a little better. They are not really a "drop in" and require some know how, but they instructions you get with them are pretty good. The trigger on that gun breaks at about 2# and doesn't stack at all.